Dr. Robin Smith writes, "If you believe that you enter a dream world on your wedding day, that you'll be lifted up and carried away on a white cloud, it will hurt like hell to be dropped back to earth. The only way to avoid the shock of pain and the residual ache that lingers for years is to give up the romantic fantasy and for your happiness in reality". Romantic fantasy, sadly, is how too many couples enter marriage which will probably just end in divorce (my opinion). 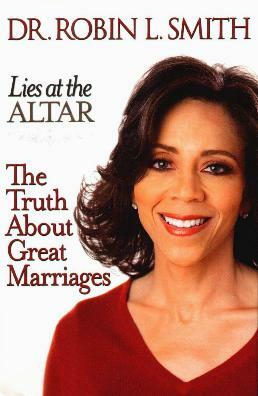 Dr. Robin Smith, psychologist, has written an interesting and enlightening book on a, "these days", very painful subject - marriage. Having gone through her own painful divorce, from a man she called her friend, not only qualifies her in this regard, but she's counselled many ailing couples too, She insists that Truth be featured highly in one's life, and especially, in a marriage if it has any chance of surviving. I agree - why even remotely consider spending the rest of your life with someone who doesn't tell the truth or isn't truthful with you? The pain, stress, and worry from someone else's lies can eat away at you and is shockingly painful (my personal experience). There are "truth and lies" notes throughout the book, some lies of which many people believe to be how it is. She talks about the marriage vows, which are broken up to form the different chapters, as well as gives advice on "How To Write True Vows to Live By", and also offers written exercises - I feel you get more from writing out your grievances, joy, expectations, etc., in all aspects of life, so why not when contemplating the hugest thing in your life? Her observations and advice are sound and constructive. Sadly, I wonder how many people will actually think they need any help at all. Many will realize five years down the road that they did. Everyone getting married (or engaged for that matter) should read this book, or any book on marriage, as so many people enter this institution blindly and end up "hurting like hell". I've always maintained I would never settle for second best (meaning my heart wasn't totally convinced) and because no one ever fell in love with me, I never married. I couldn't be happier. Conclusion - I got bored with the book as I felt it went on and on a bit. I mean, 276 questions to ask before you get married!